The burbot, Lota lota, is a member of the cod family that naturally occurs in fresh waters of northern North America and northern Eurasia. The species was illegally introduced in Wyoming above Flaming Gorge Reservoir, and it is now found in the reservoir. Burbot spawn in the winter, typically under the ice. No care is given to the eggs, which hatch in approximately 30 days. The burbot prefers cold waters, where individuals are usually found near the bottom. Young burbot eat aquatic invertebrates, whereas adults prey almost exclusively on fish. Burbot can reach a length of up to two feet, and the species is considered very good to eat. 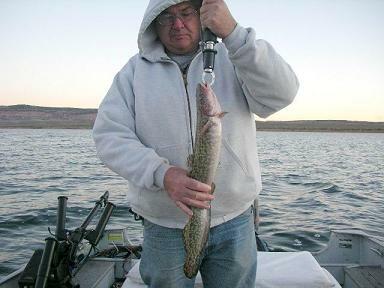 All Burbot caught must be kept and immediately killed. This is because they were illegally introduced to Flaming Gorge Reservoir. Fishing for Burbot is usually best at night. Currently they have only been spotted in the northern part of Flaming Gorge, but most likely will soon spread to the entire reservoir.